Souvenir mint julep glasses have been part of the Kentucky Derby since 1938. Almost everyone who attends the Kentucky Derby winds up taking home one or more of the souvenir glasses in which their mint julep has been served. 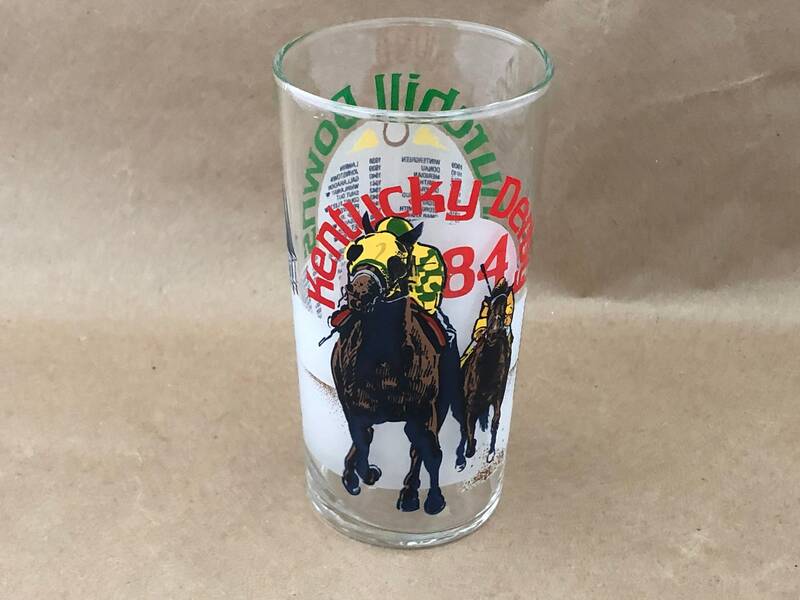 Over the years these souvenir glasses have become the most common and beloved collectible connected to the 138 year history of the Kentucky Derby. People enjoy putting together their own unique collections of Derby glasses for a wide variety of reasons ranging from the designs they like best, to the years they have fond memories with. Generally, prices for the glasses increase as they gather age and become rarer. Glasses from the 1980s and earlier are generally more expensive than the newer glasses. This 1984 glass is a nice collectible because of its age and the iconic image depicted on it of two race horses competing in the stretch run to win the race. It also has a nice silhouette of Churchill Downs with its Twin Spires on the back, as well as a listing of every Derby winner prior to 1984. The familiar upper cursive "L" is embossed on the bottom of the glass indicating that the glassware itself is from the American Libbey Glass Co.
5 1/4" tall x 2 1/4" diameter at top. Pristine condition. This glass would be a nice addition to your collection or a nice gift for another. Combine with the other 1986 Derby Glass I have listed and it would be a great couples gift.